Get ready for more intensity, both on the track and in how hard you have to concentrate to say the model name in the correct order, because Porsche just announced its newest track machine: The 700-horsepower, limited-run Porsche 911 GT2 RS Clubsport, yours for track use only and a base MSRP of $478,000. That starting MSRP is before tax, shipping and import fees, of course. The Clubsport track version of the GT2 RS is based on the street one, which was honestly frightening enough of a vehicle in its road-legal form. They both come with a 3.8-liter flat-six twin turbo in the back, sending power to the rear wheels with Porsche’s seven-speed dual-clutch transmission and paddle shifters on the carbon-fiber steering wheel because, face it, you’re not getting a stick. 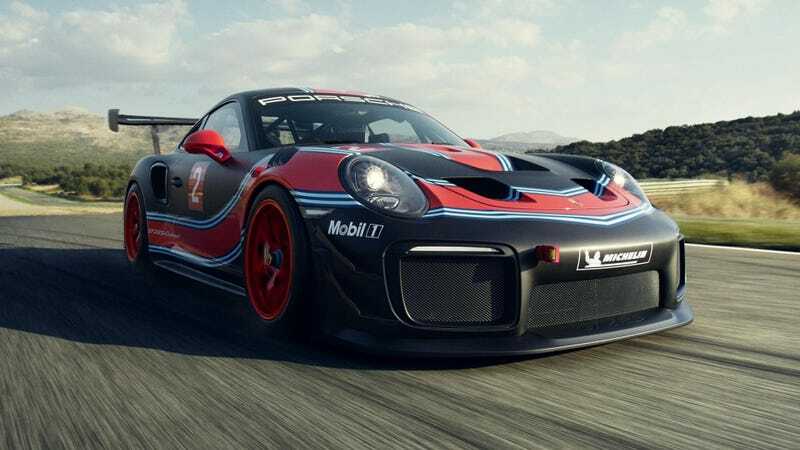 The wheel and display behind it are from the 2019 Porsche 911 GT3 R race car, Porsche said in its announcement, and the track car has the typical roll cage, bucket seat and six-point harness to make it fit for racing. It’s got giant brakes, and assistance systems like Porsche’s stability management, traction control and ABS can be turned off with a switch. The car also has air conditioning, to provide “optimal interior cooling,” Porsche said. Revolutionary. Porsche’s only making 200 of the Clubsport versions, and even giving customers ideas of where to race them—the car is eligible to run during clubsport events, Porsche Club of America track days and certain motorsport meets. Porsche plans to start delivering the cars in May of next year, which is surely around the time we’ll all have our $478,000 car budget saved up, cursing ourselves for barely missing the window on this one.